Arctic Water is the first of the three Arctic Aura haps that I designed in 2015. It is the squishiest and the warmest of all the pieces, and its colours are meant to bring a breath of fresh Arctic Aura to your everyday life. 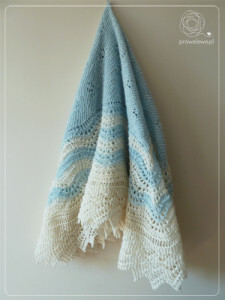 sample info The pattern sample is made of two-ply hand-spun Estonian wool in two colours: off-white and bright blue. construction Built from inside to the outside. Its centre square is knitted diagonally back and forth in garter stitch, and introduces Cat’s Paw lace motifs. Based on the square is the Old Shale wavy border made in the round and finished with a full version of the traditional peaked edging formed perpendicular to the border. This hap requires blocking. instructions type The pattern includes written and charted instructions, photographs, tips and links to video tutorials. There are directions on size adjustments provided as well.